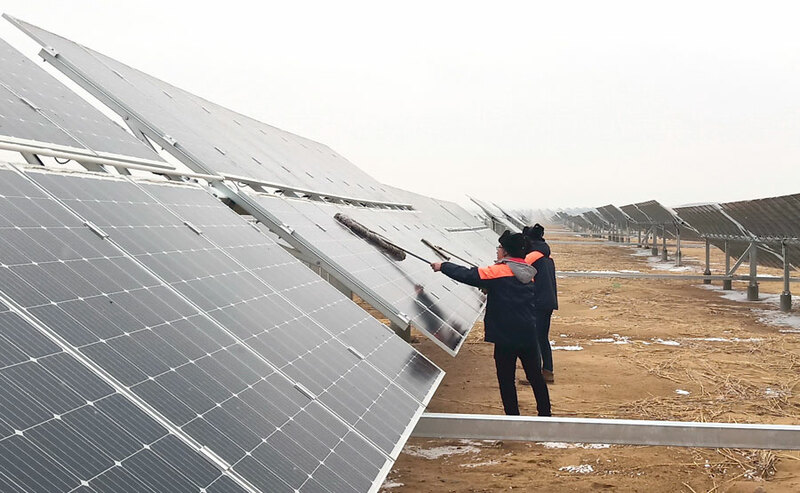 A vast barren desert in the Inner Mongolia autonomous region, with its abundant sunshine, has become a base for photovoltaic power generation. The first phase of the solar power station in the Kubuqi Desert was delivering the equivalent of an annual output of 1 billion kilowatt-hours to the national power grid as of the end of 2018, said Li Rui, director of the development and reform department of Dalad Banner, where the station is based. Along with its push to improve the power system, it's also a powerful engine to improve the environment, Li said, adding that "the solar energy is expected to reduce annual emissions of carbon dioxide by 200,000 metric tons and dust by 800,000 tons". Carbon dioxide discharged by coal-fired power plants is a major greenhouse gas, and abundant dust from the desert makes things worse. Dalad Banner has been promoting environmentally friendly energy generation in the autonomous region, especially after President Xi Jinping highlighted the importance of the modern energy industry at the annual session of the National People's Congress last year. The president required the autonomous region to modernize its energy industry through upgrades and optimization, and to increase efficiency in energy consumption. The Kubuqi Desert covers 13,900 square kilometers across three banners, including more than half of Dalad Banner. It has about 200,000 people living around it. The first project created 1,200 jobs for locals, and solar panels have been installed over more than 33 sq km of the desert, Li said, calling it "a project serving the economy and society". Photovoltaic panels can also slow the wind, which stops the movement of the desert, a statement from the department said. Projects utilizing clean power resources, especially solar and wind energy, have developed rapidly in the region, which reflects the authority's strong determination to upgrade the energy structure and pursue green growth, said Chi Dalantai, the banner's Party secretary. Once the project's three phases are complete, Dalad Banner will be capable of providing 4 billion kWh of power-valued at 1.5 billion yuan ($221 million)-and will reduce emissions of dust and carbon dioxide by 3.9 million tons annually, according to the banner's government. China has become the largest energy consumer in the world, and coal has been its major resource for decades, though coal has been put under the spotlight in the wake of growing concerns over pollution. In 2019, China will continue to reduce coal consumption to 58.5 percent of the energy mix, while nonfossil fuels, including wind and solar power, will increase to 14.6 percent, Zhang Jianhua, head of the National Energy Administration, said in December.